UPDATE: We have recieved our shipment. This package is now back in stock!! 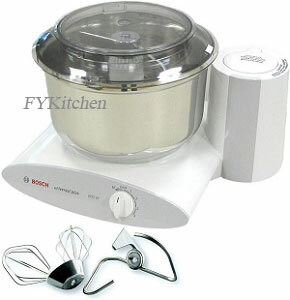 This is your Bosch Universal Plus Mixer except that this comes with a stainless steel bowl. The "New Style" stainless steel bowl comes with a post so you can still use whips and cookie paddles. 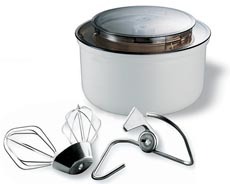 Includes the "New Style" stainless steel bowl, dual gourmet whisks, and kneading arm. Holds up to 14 pounds of dough. Mix large or small amounts. Powerful enough for any recipe. Triple whipping action is unsurpassed. Will whip one egg white into 1-1/2 cups of meringue. Optional attachments: citrus juicer, slicer/shredder, food processor, flaker mill, meat grinder, berry press, pasta disks, sausage stuffer, pastry press. Dishwasher safe parts and accessories. Parts are easily replaceable/repairable. Powerful 800 watt motor (most powerful for a household kitchen machine) with an incredible three (3) year warranty. ADD AN EXTRA BOWL TO THIS GREAT MIXER FOR ONLY $39.99!! THINK HOW MUCH FASTER YOU CAN MAKE ALL YOUR FAVORITE FOODS. MAKE COOKIES IN ONE BOWL AND BREAD OR FROSTING IN THE OTHER. ENJOY! Ideal for those who prepare foods with quality as well as quantity in mind. Renowned for quality craftsmanship and performance, Bosch continually provides the latest state-of-the-art design advances for the Universal. Your kitchen will be complete with this extraordinary mixer and wide assortment of optional accessories and attachments. The Bosch Universal is superbly engineered to provide you with many years of service and cooking enjoyment. You can always count on Bosch for high quality, sophisticated engineering and the ultimate in warranty protection. The Universal and its many attachments provide all of the advantages that cooking professionals and novices the world over desire. Non-Locking: This bowl will also fit onto previous generations of Bosch Universal Mixers. This is a pressure fit as opposed to a lock on fit. Also try these products for BETTER BREAD!